The defending Super Bowl champion Seattle Seahawks open the 2014 season at home against Aaron Rodgers and the Green Bay Packers. The marquee matchup is just one of the opening-week showdowns on the NFL Confidence Pool Week 1 sheet. 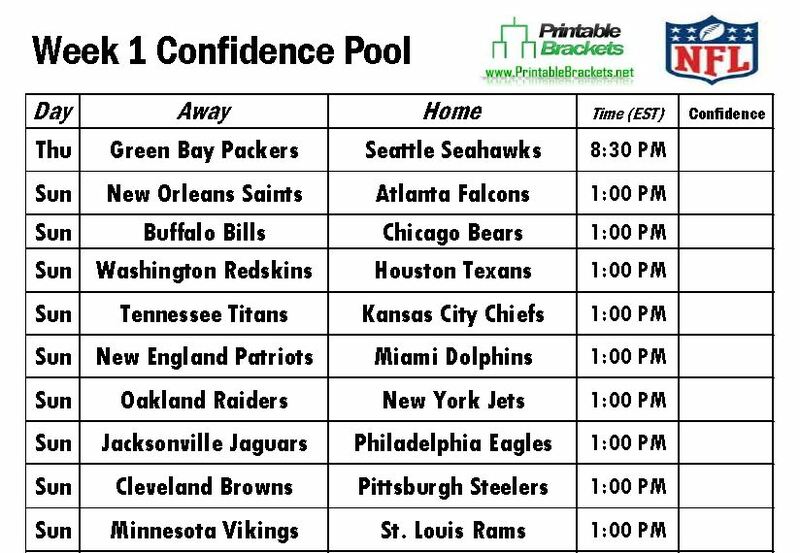 You can download and print off the NFL Confidence Pool Week 1 sheet for free. You can also download and print a traditional Week 1 Pick Em sheet. Both sheets are compliments of PrintableBrackets.net. The defending Super Bowl champ traditionally opens the season at home in a Thursday night affair and the trend continues with the Seahawks in 2014. The Seahawks will play host to the Packers, who suffered an infamous 14-12 loss in Seattle on the game’s final play in 2012. Replacement referees ruled an apparent interception a touchdown, handing the Packers the victory. Meanwhile, the AFC champion Denver Broncos will open the 2014 NFL season at home against Andrew Luck and the Indianapolis Colts on “Sunday Night Football”. Peyton Manning and the Broncos are looking to move forward after suffering a 43-8 loss to the Seahawks in Super Bowl XLVIII in February. Not one, but two “Monday Night Football” games are on the NFL Confidence Pool Week 1 sheet. First, the New York Giants will be in Detroit to face the Lions. Later in the evening, Philip Rivers and the San Diego Chargers will be on the road to square off with Larry Fitzgerald and the Arizona Cardinals. Other games of note on the NFL Confidence Pool Week 1 sheet include the New England Patriots against the Miami Dolphins, the New Orleans Saints squaring off with the Atlanta Falcons, the Pittsburgh Steelers hosting the Cleveland Browns, the Dallas Cowboys welcoming the San Francisco 49ers, and the Cincinnati Bengals battling the Baltimore Ravens.